I have what you might call an arsenal of salts. Sea salt, kosher salt, flavored salts, fine salt and even good old Morton's. I never met a salt I didn't like. Black lava salt from Maui? I'm totally there. 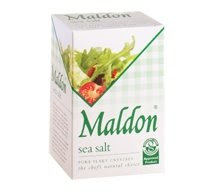 If you have yet to try Maldon Sea Salt, I highly recommend you go out and find a box right now. It's not a cheap salt at $8 - $12 a box, depending on where you get it, but since it's generally used as a finishing salt, a box will last you a long time. Most of the salt flakes come in the shape of little pyramids and have an amazing crunch when you bite into them. I like to sprinkle them over meat right after cooking and have even been known to sprinkle one or two flakes over freshly baked chocolate chip cookies. That salty crunch as you bite into something sweet and chocolaty is absolutely amazing. You can find more information on Maldon's web site here. I used to only be able to find it at specialty shops, but I have started to see it at Whole Foods and some other major retailers. What are your favorite salts or seasonings that you couldn't live without in the kitchen? Thanks for the great review. Have a nice weekend! I use this one too, it is definitely my salt of choice! I use this about 95% of the times I need salt in my cooking. I've also tried Maldon's peppercorns, which are on the same level as the salt. Both are definitely worth trying.